A transformer is a device for stepping-up, or stepping-down, the voltage of an alternating electric signal. Without efficient transformers, the transmission and distribution of AC electric power over long distances would be impossible. Figure 51 shows the circuit diagram of a typical transformer. There are two circuits. Namely, the primary circuit, and the secondary circuit. There is no direct electrical connection between the two circuits, but each circuit contains a coil which links it inductively to the other circuit. 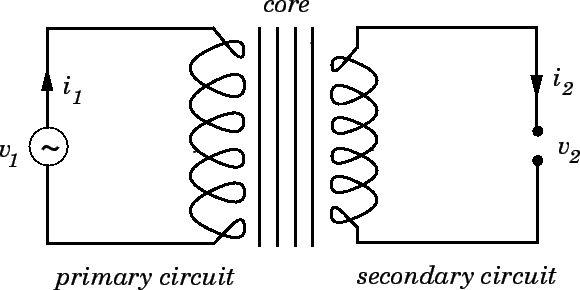 In real transformers, the two coils are wound onto the same iron core. The purpose of the iron core is to channel the magnetic flux generated by the current flowing around the primary coil, so that as much of it as possible also links the secondary coil. The common magnetic flux linking the two coils is conventionally denoted in circuit diagrams by a number of parallel straight lines drawn between the coils. Figure 51: Circuit diagram of a transformer. around the secondary circuit, where is the peak current. Note that, although the mutual inductance of the two coils is entirely responsible for the transfer of energy between the primary and secondary circuits, it is the self inductances of the two coils which determine the ratio of the peak voltages and peak currents in these circuits. In other words, the ratio of the peak voltages and peak currents in the primary and secondary circuits is determined by the ratio of the number of turns in the primary and secondary coils. This latter ratio is usually called the turns-ratio of the transformer. If the secondary coil contains more turns than the primary coil then the peak voltage in the secondary circuit exceeds that in the primary circuit. This type of transformer is called a step-up transformer, because it steps up the voltage of an AC signal. Note that in a step-up transformer the peak current in the secondary circuit is less than the peak current in the primary circuit (as must be the case if energy is to be conserved). Thus, a step-up transformer actually steps down the current. Likewise, if the secondary coil contains less turns than the primary coil then the peak voltage in the secondary circuit is less than that in the primary circuit. This type of transformer is called a step-down transformer. Note that a step-down transformer actually steps up the current (i.e., the peak current in the secondary circuit exceeds that in the primary circuit). Thus, if the power transmitted down the line is a fixed quantity, as is the resistance of the line, then the power lost in the line due to ohmic heating varies like the inverse square of the peak voltage in the line. It turns out that even at very high voltages, such as 50kV, the ohmic power losses in transmission lines which run over tens of kilometers can amount to up to 20% of the transmitted power. It can readily be appreciated that if an attempt were made to transmit AC electric power at a peak voltage of 110V then the ohmic losses would be so severe that virtually none of the power would reach its destination. Thus, it is only possible to generate electric power at a central location, transmit it over large distances, and then distribute it at its point of consumption, if the transmission is performed at a very high peak voltages (the higher, the better). Transformers play a vital role in this process because they allow us to step-up and step-down the voltage of an AC electric signal very efficiently (a well-designed transformer typically has a power loss which is only a few percent of the total power flowing through it). Of course, transformers do not work for DC electricity, because the magnetic flux generated by the primary coil does not vary in time, and, therefore, does not induce an emf in the secondary coil. In fact, there is no efficient method of stepping-up or stepping-down the voltage of a DC electric signal. Thus, it is impossible to efficiently transmit DC electric power over larger distances. This is the main reason why commercially generated electricity is AC, rather than DC.